Minister Richards thanks Special Olympics 50-year record holder Beamon for his outreach in the federation. BASSETERRE, St. Kitts – Minister of Sports the Honourable Shawn Richards praised Special Olympics 50-year record holder for long jump Robert B. Beamon for his support of the success of Special Olympic activities in St. Kitts and Nevis. In an interview conducted March 23 to commemorate the 50-year-anniversary activities of the organization, the minister praised Beamon for his collaboration with the Ministry of Sports. 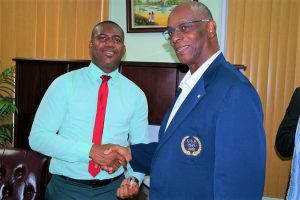 Permanent Secretary in the Ministry of Sports Stanley Knight said that of the class of Olympians that are sent overseas to represent the federation, the special Olympians have proven to be most successful. “The national teams that have gone out to represent us at the world games, they have probably been our most successful and most consistently performing international teams,” said Knight. He also noted that more awareness is needed to promote Special Olympics in the federation and that the roll out of the National Sports Policy will provide an outlet for inclusion for all persons. “It [the policy] gives a special opportunity for inclusion because we are looking for buy-in from everyone, from all stakeholders and on the tenet of providing opportunities for all in sports; it’s not just a matter of providing for a disparate group, but more importantly integrating all groups together,” he stated. The Special Olympics Association in St. Kitts will host an Open Water Swim and Beach Games event at Frigate Bay Beach March 25 as a part of the Special Olympics 50-year anniversary activities. The Special Olympics is celebrating its 50-year anniversary since its inception in 1968. It is a sports organization for people with intellectual disabilities and is designed to be an inclusive programme that helps to unify sports and transform lives.